I desire quiet closeness with You. Quiet time. One of my favorite things about being with my husband is that we can be alone, together. We can share space and closeness without feeling compelled to say or to do anything. Though those times are rare, and so often interrupted by a child or the dog, I delight in them and am thankful. They are blissful, hushed acknowledgements of intimacy that do not require a soundtrack, and that is what I crave with God. He is always there, ever watchful, ever vigilant, ever loving, and I am obliged to give devoted service in gratitude. I only wish I could master the art of stillness, to quiet myself, stripping away all the stuff that would keep me from You. I will never be a nun. I will never be cloistered. Real stillness, absolute quiet, let’s be honest, is kind of scary. Generally, I need a soundtrack to still the noise before I can even find quiet. How crazy and counterintuitive is that? As a runner, I use music to control distractions. I have also deliberately ceded my running time to devotion, because it is time I can permissibly carve out without guilt. So here, once again, I make a declaration of intent. I pray when I run, and now I will practice stillness and quiet as I stretch daily. I will be conscious about making it quiet. In a world filled with busyness, we feel guilty about not doing. In a world filled with stuff, we find ourselves cluttered. I’ve got too much stuff, and I’ve got too much noise. So I’m stripping it down, beginning today. 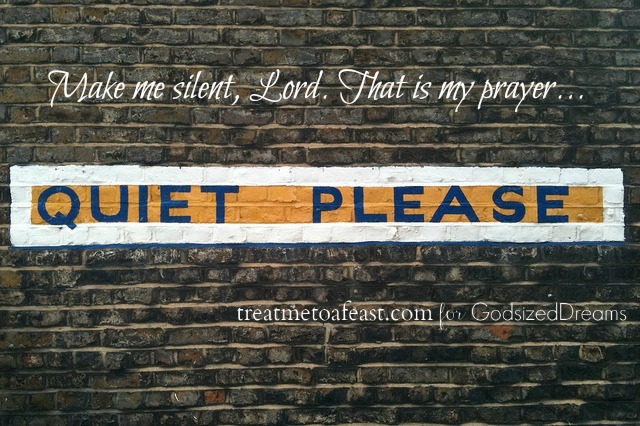 Perhaps I’ll hear more, or, maybe I will simply learn the discipline of being quiet, being still, being obedient. Wow. Because one thing I have come to acknowledge is that the lesson you think you’re learning is not always the lesson you get. (<==== Click to tweet) So, because I need to learn this lesson, I will purposefully pursue it. So, up I get, from this perch, to stretch and be quiet. I will seek Your voice and turn away from the world, beginning my own spiritual game of Hide and Seek. For a time, a precious little while, I will hide from noise and seek His face. I will practice quiet. (<==== Click to tweet) And among my many distractions, things to do, people to see, stuff to manage, I will continue to feel abundantly blessed, because while there could always be more, there is still so much from which I must withdraw, and for that, today, I am thankful. It is this day’s grace. It is action in pursuit of my dreams, those He planted within me…those I seek when I hide myself in Him. “Make me be silent.” That is my prayer. Yes and Amen! PrayN we all be more like David! Cleansed from our every hidden sin and not greatly shaken as is this post. your retreating into quiet got me thinking, again. Particularly in the wake of #Ferguson, #EricGarner, #JamesFoley and our 24 hour news cycle, we need to draw away, and draw nigh unto Him. Can we even hear Him? Amen. I realize that I live a noisy, beautiful, messy life, and I will not complain. However, it is never a bad time to Steal Away, as the old song reminds us. Oh Chelle, How I needed this. Thank you! Sometimes I wonder if our ancestors more active quieter lives were more conducive to prayer and listening for His whispers. I’m joining you in prayer, “Make me silent.” Blessings! I’m certain of it. As a society, we often create empty noise as a distraction. I always think of the spiritual, “Steal Away.” I’ve committed to developing that habit. You in? Saying a big “amen” to this prayer, friend! Amen! As life is given to me, I am learning and appreciating silent/quiet/still times. I look forward to the times that I have it as I find some of my best “self” in it. So glad you shared this. We need that still quiet (mentally, physically, and spiritually) with the Lord, but it can be such a challenge to settle our hearts into him. I love the way he works in the midst of our lives to teach us new levels at different seasons. Blessings!